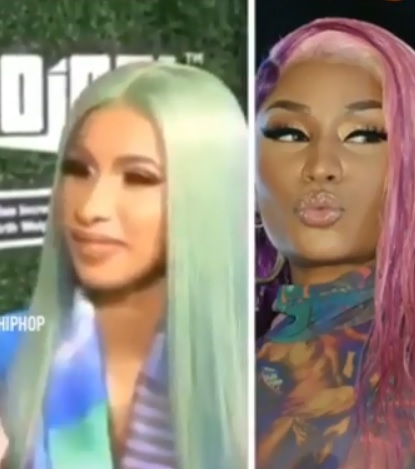 Cardi B has been awkwardly asked is in future she will mend relationship with her friend-enemy Nicki Minaj and will she collaborate with her in future and her reaction is hilarious making the situation even more awkward. 'Invasion of Privacy' hit maker Cardi B, 26 has been asked the ultimate question in the rap industry "Will her relationship with Nicki Minaj, 36 mend in the future resulting in yet another collaboration?" to which she straight of did not gave a negative answer to the topic instead replaced with hilarious reaction which simply said NO. During one of the red carpet interview recently, the interviewer asked Cardi B, "Is there ever a chance that you and Nicki will make up and perform together?" She awkwardly gave smile to the interviewer with no answer. Interviewer tried to get answer saying "Okurr" but then Cardi started to laugh in her signature laugh and simply resided the topic. Cardi's silence to the answer to the question as well as her hilarious awkward laugh surely indicated a big NO to the question in a silent manner. She was quiet intelligent to not get provoked by interviewer question and just not get involved in yet another feud. Cardi B and Nicki Minaj had previously already collaborated in "Motor Sports" with Migos which had been a hit song and reached top of various charts. The feud between Cardi and Nicki had already started at that time as both were strong contender in the rap industry which ended quiet unwell in Met Gala.